Actor Leonardo DiCaprio and movie director Martin Scorsese seen on the set of new film "The Wolf of Wall Street" in New York City. The actor, who has teamed up with Scorsese after he directed him in the critically acclaimed "Aviator," "Gangs of New York," and "Shutter Island," wore a suit and had his hair slicked back while sipping a coffee and carrying a bagged lunch. DiCaprio later carried a briefcase and appeared to be trying to hail a cab. 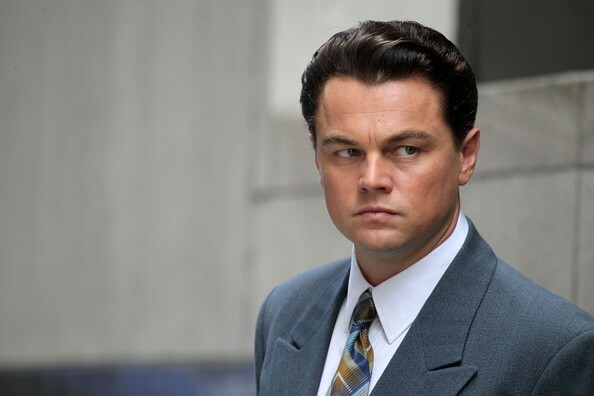 Leonardo DiCaprio filmed 'The Wolf of Wall Street' wearing his hair in a slicked-back wavy style.